Well, it isn’t really a good idea to touch this, even though I have a few times. This is one of my favorite caterpillars, the Saddleback. It is the larva of an inconspicuous brown moth, Acharia stimulea. 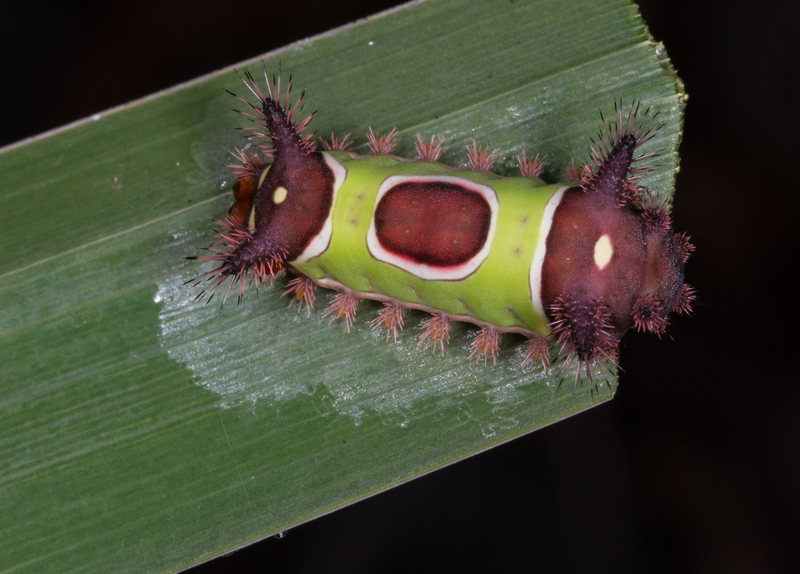 The larva is named for the saddle-like pattern (green around the middle “saddle blanket”, with a brown oval spot “saddle” edged with white) in the center of the back. This distinctive larva is one of the unusual group of moth larvae known as slug caterpillars, family Limacodidae. 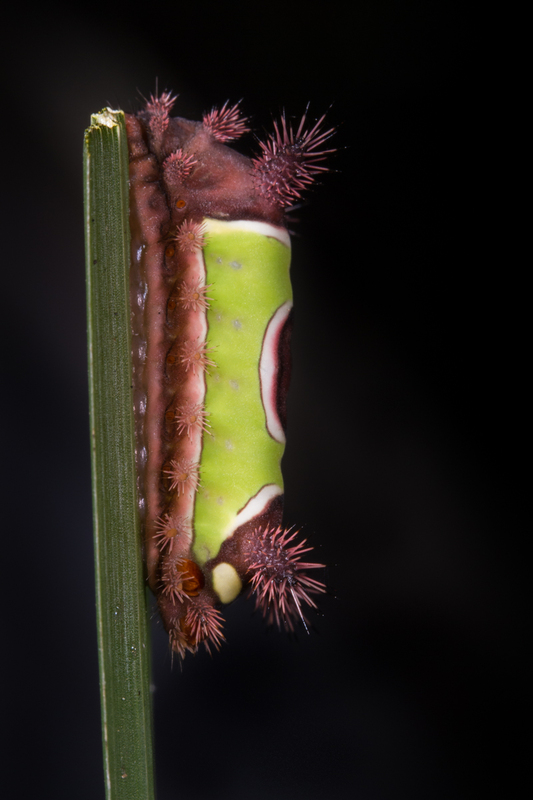 Instead of having paired prolegs on their abdominal segments like most caterpillars, the slug caterpillars have suckers on the first seven segments. Larvae also secrete a semi-fluid silk as they move to help increase body contact and adhesion with the leaf (this can be seen in the first image). So, instead of crawling, they glide. I love the quote by David Wagner in his classic reference, Caterpillars of Eastern North America – “relative to other caterpillars, slug caterpillars seem more fantasy than reality”. Indeed, they are a strange lot, and this one is one of the strangest, and most painful when touched. Several members of this family have the ability to inflict painful “stings” by means of sharp spines, which, on some species, have associated toxins to enhance the pain to the recipient. 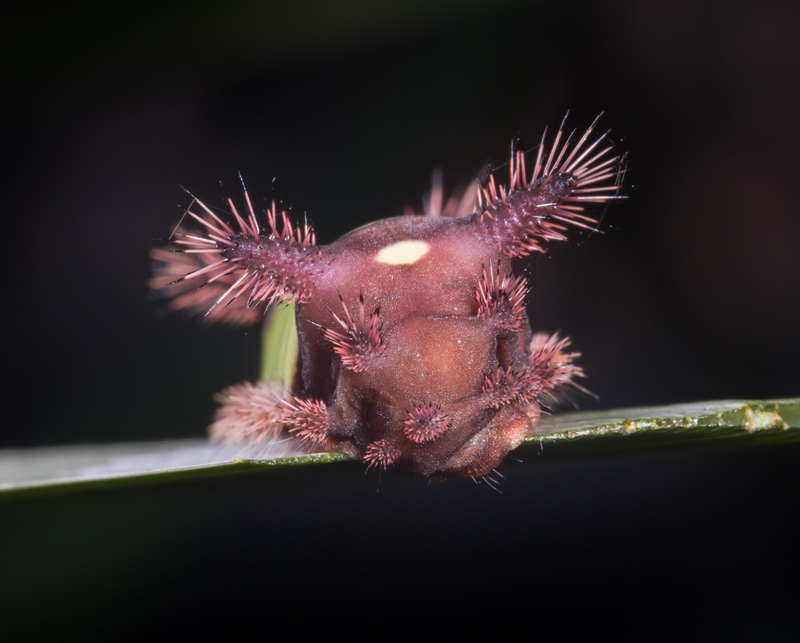 These stinging spines, known as urticating spines, are most numerous on the fleshy tubercles, or “horns”, adorning both ends of the caterpillar body. I have often found a caterpillar quite by accident when weeding in the garden or moving a plant leaf and then receiving a series of stings and resulting small welts where I brushed up against the spines. It feels a lot like a wasp sting but, for me, dissipates more quickly, although the reddish welts may persist for many minutes. But susceptible people may experience intense pain and allergic reaction, so caution is advised when you encounter these unusual beauties. When disturbed, the larvae often arch their body upward, exposing the intruder to more of the spines. They also have a false face on the posterior end, created by a pattern of light-colored spots. Even the cocoon should be handled carefully as they incorporate some of the irritating spines into the silk covering. These are generalist feeders found on a wide variety of plants, although I often find them on iris leaf blades in the garden. But, in spite of their formidable protection, I always enjoy finding these interesting caterpillars. Now, if only it will stay this way another week until the Museum’s largest special event of the year, BugFest (I’ll be volunteering at the caterpillar tent). I have a feeling I’ll be wishing that a lot in the next few days as I find various caterpillars about ready to pupate…what a difference a week makes! 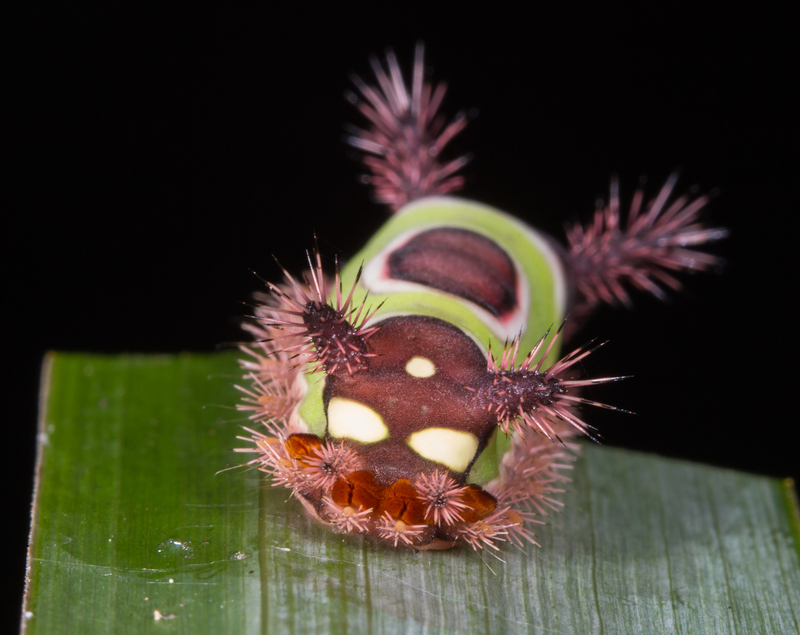 This entry was posted in Natural History and tagged saddleback caterpillar, stinging caterpillar, urticating spines by roadsendnaturalist. Bookmark the permalink.